Note: Not at the old Poker1 site. 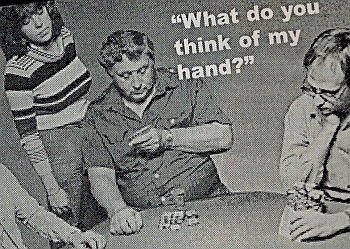 A version of this entry was originally published (1996) in Card Player magazine. Rediscovered and added to Poker1 in 2014. Have you ever been playing poker when you looked up and noticed that your opponent has company? Sometimes, he’s sharing his hand with a fellow player who happened to be wandering around the cardroom. If this is true — if the hand is being shared with a sophisticated player — today’s tell doesn’t always apply. In fact, in that case, if your opponent has already bet, you should not rule out a bluff. But usually, it’s a friend, wife, or husband who’s standing behind the player, gazing at the hand that’s voluntarily being shared. Description: The man in the center is competing for this pot. Sometime after he became involved, his girlfriend walked up. At that point, he decided it was all right to let her see his cards. Motivation: Perhaps he wants her to know that he’s playing a legitimate hand and is not gambling recklessly. He also may want to impress her with his card-playing ability, feeling pretty confident that his hand is good enough to claim the pot. Discussion: Usually, if a man is involved in a hand that he knows he shouldn’t be playing, he will not share it with a pal, wife, or girlfriend who happens along in the midst of poker combat. If he does share it, it’s probable that the hand is strong enough to merit his investment. If this guy held poor cards or was bluffing, he likely would be afraid to show his hand for two reasons. First, he might unwillingly impress upon the onlooker that he plays poorly. Second, the onlooker might accidentally tip off to his opponents that his hand is weak, costing him the pot. Strong players are less likely to exhibit this tell, and some may even use it as a ploy to attempt a bluff. Against a strong opponent, watch the onlooker for clues.